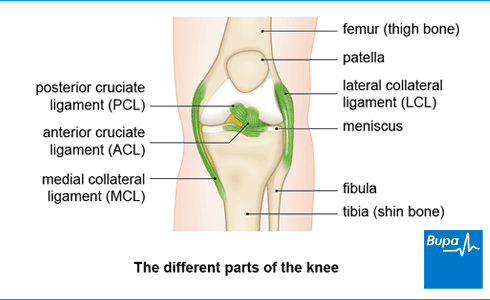 Your posterior cruciate ligament (PCL) is one of the ligaments inside your knee. It gets its name from the fact that it passes behind another ligament, the anterior cruciate ligament (ACL), forming a cross shape. Your PCL connects your thigh bone (femur) to the back of your shin bone (tibia). Along with the other ligaments in your knee, it keeps your knee stable and prevents your thigh and shin bones moving out of place. A PCL injury can be a partial or a complete tear, or an overstretch of the ligament. Knee ligament injuries are also referred to as sprains. They’re given different grades depending on how severe an injury it is. PCL injuries are less common than ACL injuries, but it’s common to injure other parts of your knee at the same time as your PCL. It’s common to injure other ligaments, or other parts of your knee at the same time as your posterior cruciate ligament (PCL). Together these may cause general symptoms of pain and swelling in your knee. If you only injure your PCL, you may have no (or few) symptoms at first, and may not even be aware that you’ve damaged it. You’ll probably be able to walk normally afterwards. You may get some pain behind your knee though, especially when you kneel, and there might be some mild swelling. If your injury goes untreated for some time, you may begin to get more generalised knee pain, including at the front of your knee. You may also begin to find it uncomfortable descending an incline, for instance walking or running downhill, or descending stairs. You may also have discomfort when you start to run, if you lift a heavy weight or if you walk longer distances. You may also injure your PCL if your knee is extended beyond its normal range of movement. The treatment you’re offered for your posterior cruciate ligament (PCL) injury will depend on several things. These include how severe the damage is, whether other parts of your knee are also injured, and how well you respond to treatment. The initial treatment will be to control your pain and swelling using the PRICE and HARM self help measures. Details of these can be found on the next tab. Further treatments include physiotherapy, medicines and surgery. You may see an orthopaedic surgeon (a doctor who specialises in bone surgery) or a sports medicine professional, such as a sports doctor or a physiotherapist. A physiotherapist is a health professional who specialises in maintaining and improving movement and function. There are different treatments that your doctor or physiotherapist may suggest, and a lot that you can do yourself to help your recover. You can take over-the-counter painkillers, such as paracetamol or ibuprofen, to help relieve your pain. Your doctor may prescribe stronger painkillers if your pain is severe. As well as easing your pain, non-steroidal anti-inflammatory drugs (NSAIDs) such as ibuprofen may help to reduce inflammation and swelling. Always read the patient information that comes with your medicine, and if you have questions, ask your pharmacist or GP for advice. Making sure you follow any physiotherapy and rehabilitation programme you’re given will be an important part of your recovery. The aim of physiotherapy is to help your knee recover its full range of movement and its strength and stability. Your physiotherapist will carefully assess your knee then plan a programme of rehabilitation exercises to suit your individual needs. Exercises to strengthen your quadriceps (thigh) muscle are especially important after PCL injuries. You should be able to return to your normal activities, including sports, within nine to 12 months after your operation. You’ll need to follow a course of physiotherapy first, to build the strength up in your thigh muscles. Ask your doctor about the pros and cons of surgery, and how it might help in your own circumstances.